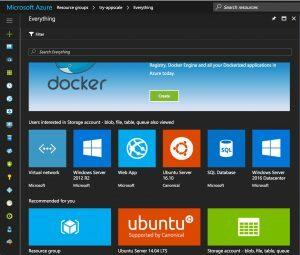 How do I get the latest AppScale image in Azure? 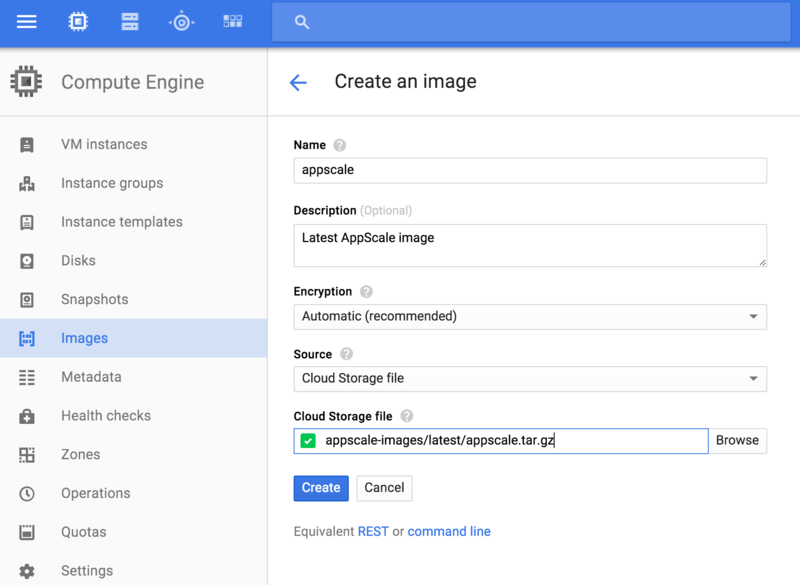 How do I create a GCE instance with the latest AppScale image? 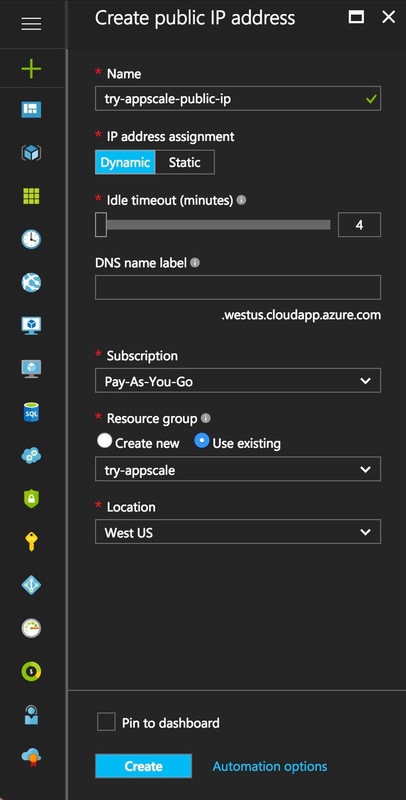 How do I create an Azure instance with the latest AppScale image? 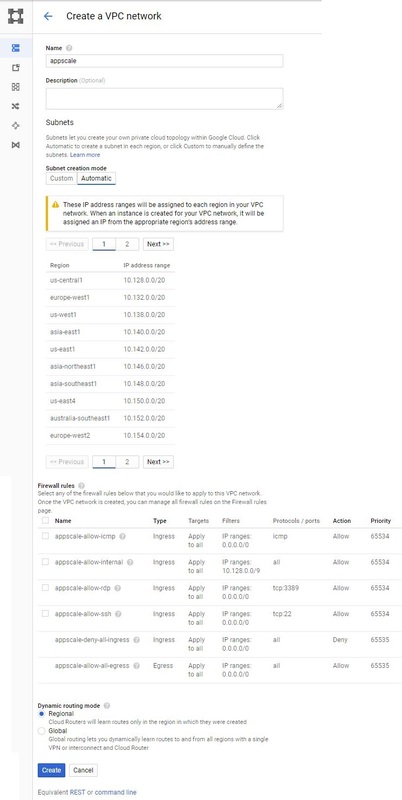 How do I get the latest AppScale image in AWS EC2? How do I get the latest AppScale image in GCE? How do I get the latest AppScale image for Vagrant/VirtualBox? How do I install AppScale Tools? How do I create and customize my AppScalefile? How do I set up password-less SSH? How do I login as root for Azure? What about security in AppScale? 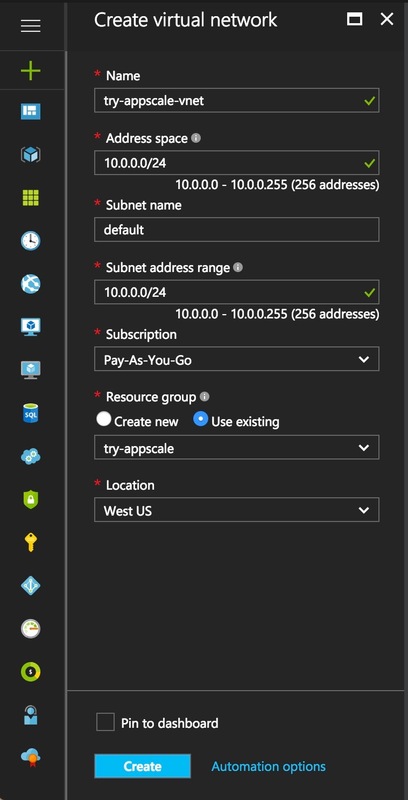 How do I setup a network rule suitable for AppScale in Azure? How do I setup a network rule suitable for AppScale in AWS? 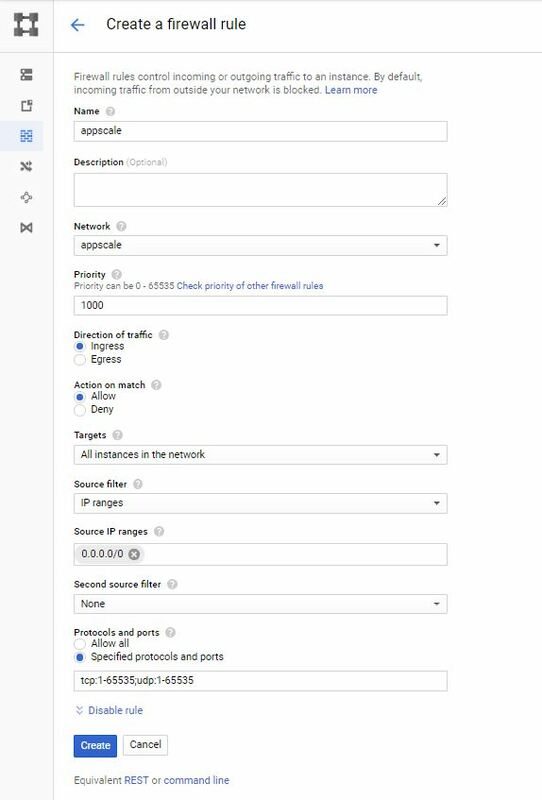 How do I setup a network rule suitable for AppScale in GCE? What if I don’t want to make a generic network rule with all ports open? 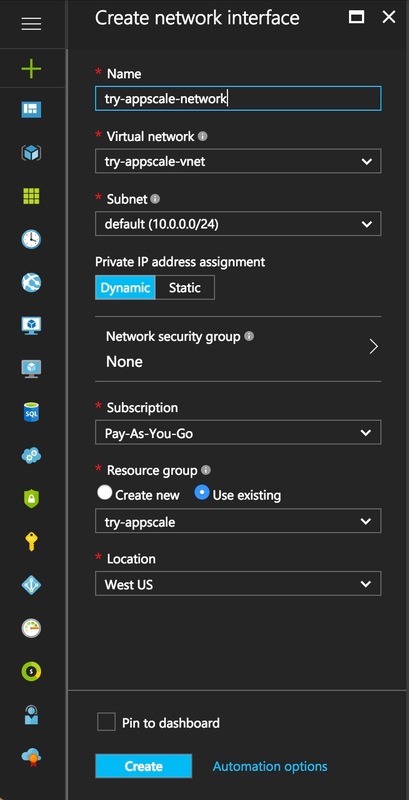 How do I set up Service Principal for my Azure subscription? How do I access the AppScale Dashboard? 1. You will have to create a new resource group and a storage account associated with it on the Azure portal. Networking: Pick under network interfaces the network ‘AppScale’ you’ve created. **BLOB-URL: The URL of the copied over image into the storage account. You would be prompted for a username and password and now a virtual machine instance would now be created within the resource group. Login with the username and password and to login as root click here. You can find the latest AppScale AMI here. For a complete list of regular and FastStart AMIs visit our GitHub releases page. And click create. Creating the image can take a couple of minutes. AppScale manages the firewall on each machine of a deployment. This allows AppScale to only open ports that are required for its operation. AppScale leverages iptables in the underlying system, and provides facilities for the administrator to allow or deny basic access to functionalities (for example the AppScale dashboard could be made accessible only from certain IPs). 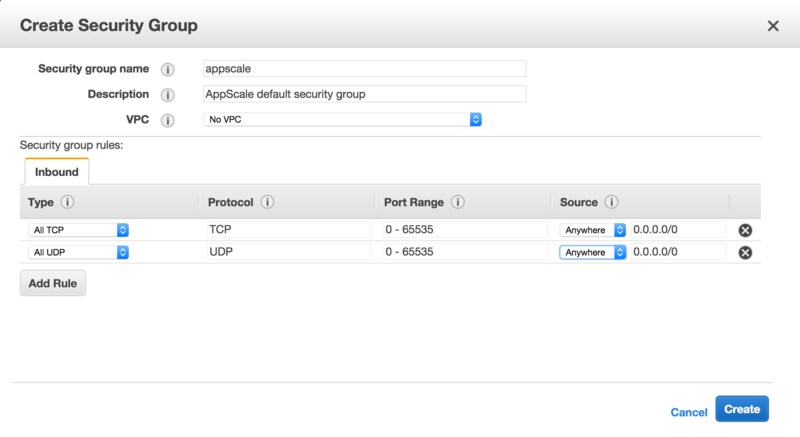 Since AppScale manages the firewall directly, the easiest way is to setup a network rule with all the ports open. To do so, click on the Network security group and create a new rule with all ports open. – create a new security group with the following settings: Group name: ‘appscale’, Description: ‘AppScale default security group’, VPC: ‘No VPC’. Add two rules to the security group: ‘All TCP / TCP / 0 – 65535 / Anywhere / 0.0.0.0/0’ and ‘All UDP / UDP / 0 – 65535 / Anywhere / 0.0.0.0/0’. 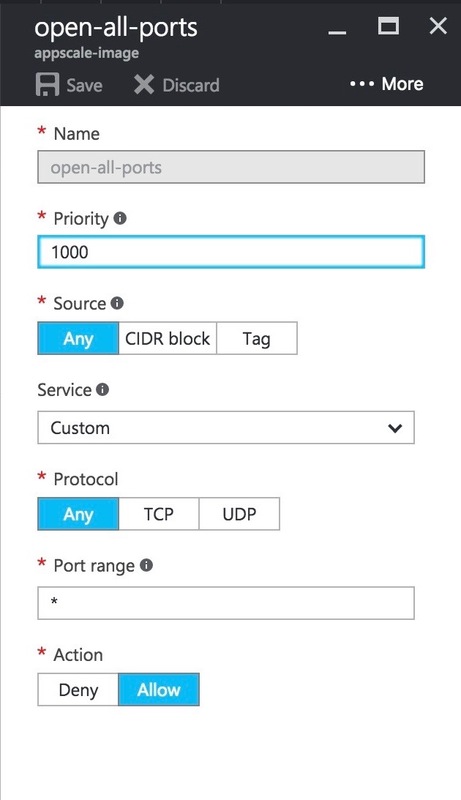 – TCP 8080-8100 and 4380-4400: those are ports that will be used in a FIFO manner when multiple applications are deployed. Are needed only if/when you have/want more applications running here. There are other ports that make it easy to control/debug an AppScale deployment but they are not necessary for normal operation. You can check in /root/appscale/firewall.conf (link to github page?) for the reserved ports. AppScale requires all ports open amongst the nodes of its own deployment. Usually this is easily achieved in public networks when instances belong to the same security group. AppScale is configured using an AppScalefile. The AppScale Tools initially use the AppScalefile to understand the deployment layout (i.e. where the login node is, how many database nodes there are, where they are, etc. ), and subsequently to start and manage the deployment. An AppScalefile is created after running the fast-start script. For more samples of the AppScalefile, click here and here. and look into the newly created AppScalefile. Need to SSH into an AppScale-ready instance as root? What’s your infrastructure? Log into the head node as root. Optionally provide the file to save the keys and a passphrase. Press Enter to go on with the default settings (/root/.ssh/id_rsa.pub). Copy the contents of this public SSH key in /root/.ssh/authorized_keys on all virtual machines of the same AppScale deployment. Make sure you have a Microsoft Outlook/Azure account and you have suitable access permissions set for your subscription. Here we are using the Azure CLI to create a Service Principal for the Active Directory application you intend to deploy on AppScale. 2. Use the command to create a Service Principal for your application by providing a display name, the URI to a page that describes your application, the URIs that identify your application, and the password for your application identity. Make a note of the Object Id and the Service Principal name from the result as it is needed when granting permissions and logging in. 3. Grant the Service Principal permissions on your subscription. You would need to assign an appropriate role with write access (e.g. ‘Contributor’). 4. If you want to create the Service Principal with a password, you need to provide credentials via the CLI. You are prompted for the password. 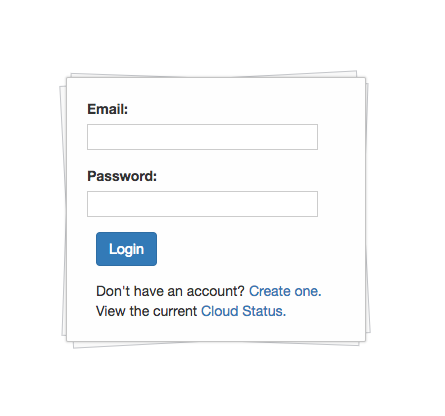 Provide the password you specified when creating the AD application. You have now authenticated the service principal that you created. 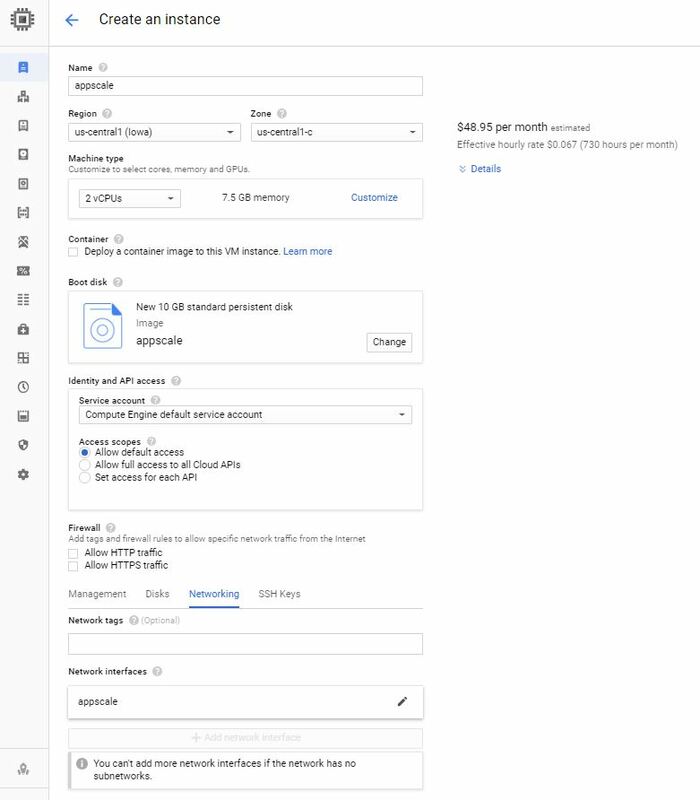 Each deployment starts the AppScale Dashboard (GUI). It is reachable at the public IP of the headnode or any load-balancer at port 1080 (you will be redirected to the secure port at 1443). Once you reach the dashboard URL (the images above) you will need to log in to be able to access all the functionalities.